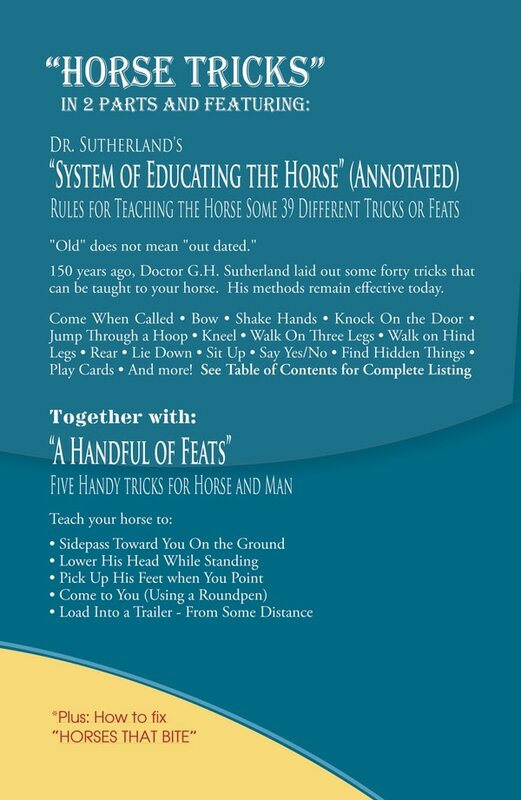 "Horse Tricks, In 2 Parts and Featuring: Dr. Sutherland's System of Educating the Horse (Annotated): Together with: 'A Handful of Feats'"
Click here to hear "Horse Tricks," Chapter 2: To Make a Bow," an entire chapter from the book "Horse Tricks." Chapter 36: TO TELL HIS AGE, DAYS IN THE WEEK, MONTHS IN THE YEAR, ETC. • Bonus chapters offers a fix for "Horses That Bite"
NOTE: The free or cheap copies of "Dr. Sutherland's System of Educating the Horse" found elsewhere online are poorly scanned-in, blurry and very difficult to read. The material you'll find here in my book has been reformatted for the modern era. More importantly, I've annotated the material ("added comments") and included 6 additional chapters written by myself. This book brings together public domain material written by G.H. Sutherland, MD and by me, Keith Hosman. It is published in two sections. 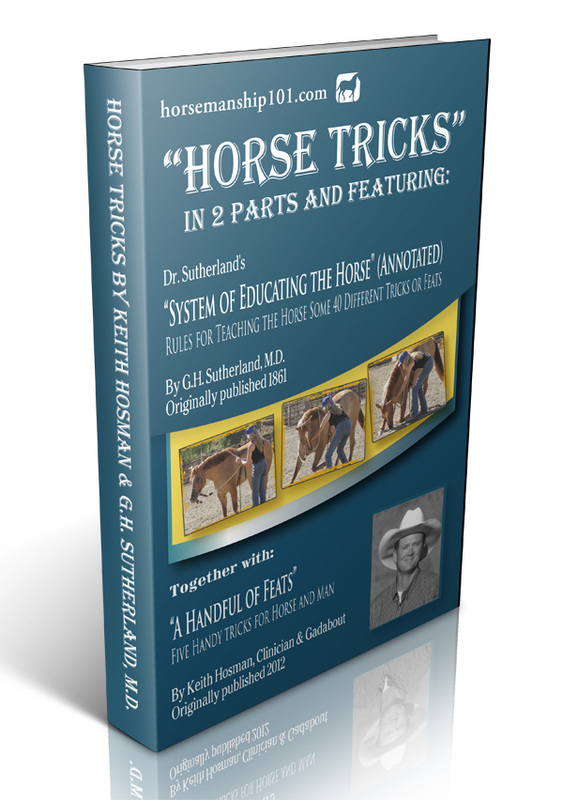 The first is a collection of dozens of tricks you can teach your horse and was written in 1861 by Dr. Sutherland. The second contains five "feats" I put to paper after finding them to be quite popular at my clinics. You will also find a fix for horses that bite, should they get nippy following some of the training which calls for the horse to pick objects up with its mouth and the like. I have annotated Dr. Sutherland's work. That’s a fancy way of saying that I read through his material, then added comment to each chapter based on personal experiences, modern thinking and techniques. Know that, while they may be short, each observation or insight was placed with care; each can make big changes fast somewhere in your training. I daresay you just might recoup the cost of this book somewhere in that sea of italicized notes. Still, why should you lay down your hard-earned cash for a horse-training book written generations ago? Because author G.H. Sutherland could train horses to do tricks that you'd like to learn -- and when something works, it works. Besides, in all this time, what's really changed? It's still a human using the same simple tools to teach a horse to do the same maneuvers.